Our 2019 packages offer friendly accommodation in the heart of Sun Peaks with basic package starting from just $399 (plus s/c) for 3 nights’ accommodation + festival wristband! 2019 Festival Package on sale NOW! Gather your gang and get ready to book. 1. Book together to stay together! When booking your packages, pick ONE person to pick your accommodations so that you get the best price available! The one person must pay all deposits (per person) in order to complete the booking. What does that mean? Well, if you wanted to book a 4 person room, the leader would have to pay $150 x 4! 2. Don’t know everyone in your party yet? No worries! You can add “placeholder” names within your booking so that you don’t have to worry about missing out on the best early prices! You can choose to add the names of your party members at a later date. 3. Only $150 (+ s/c) deposit is needed to complete your booking! Then you can pay as you go until the last payment day on Friday, February 15th at 11:59pm. 4. Don’t know about the Extras yet? All Extra Options can be added to your booking at a later date. Convenience is key! Stay at any of the accommodations in Sun Peaks starting at just $399 per person. All festival packages include a festival wristband so going from your bed to the stage is that easy! 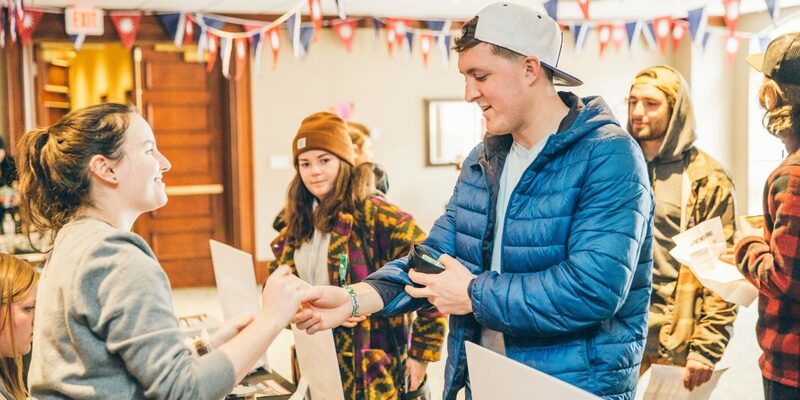 Your Snowbombing Canada wristband grants you access to all the key venues such as The Crystal Cave, The Underground, The Sunset Terrace and The Street Party and is included in every festival package. Have your accommodation sorted or you’re Sun Peaks resident? Don’t worry, we’ve got you covered! Limited Wristband Only tickets will be available for purchaser closer to the festival date – stay tuned! There are multiple ways to get to Snowbombing Canada, whether you choose to drive or fly, just remember to get here in time for the action! Be prepared! Book your ski pass, equipment rental and more with us to ensure you hit the slopes running once your arrive at Snowbombing Canada. Still got questions? Browse the FAQs section below, where we’ve grouped together our most common queries. The 2019 event starts from Friday, April 5th to Sunday, April 7th with various stage times opening from 11am to 3am. Snowbombing Canada 2019 is not on sale yet, but please stay tuned! Deposits are $150 + s/c and the last payment date is Friday, February 15th at 11:59pm. Single Day Tickets will be available for purchase closer to the festival date. Can I just purchase a festival wristband? Yes Wristband Only Tickets will be available for purchase closer to the festival date. Can I purchase a VIP Upgrade? Yes! There will be a VIP Upgrade option available to add onto your festival package when booking. The VIP Upgrade is $100 (+s/c) and includes VIP Area & Access at The Street Party, Basecamp & The Underground, a VIP Welcome Package, VIP Check-In for pass and hotel credential pick up and 20% off all SBC & Blueprint Merch! Which venues do I get access to with my festival wristband? The festival wristband grants you access to the festival grounds and all key venues such as Crystal Cave, The Underground, Basecamp, Cariboo Club, Morrisey’s, Sunburst Terrace and The Street Party. Can I rent snow equipment? You can pre-book your equipment rentals at the time of booking or at a later stage via your customer account. Pre-booking this is highly recommended, as rentals are a first come, first serve basis. I live/work in Sun Peaks, is there an opportunity for local residents and seasonnaires to purchase festival wristbands? Yes, festival wristbands for local residents will be available for purchase from Sun Peaks Resort. These wristbands can only be purchased in person with the correct identification. Eligibility will be strictly checked through a photo ID and proof of address or copy of employment contract. 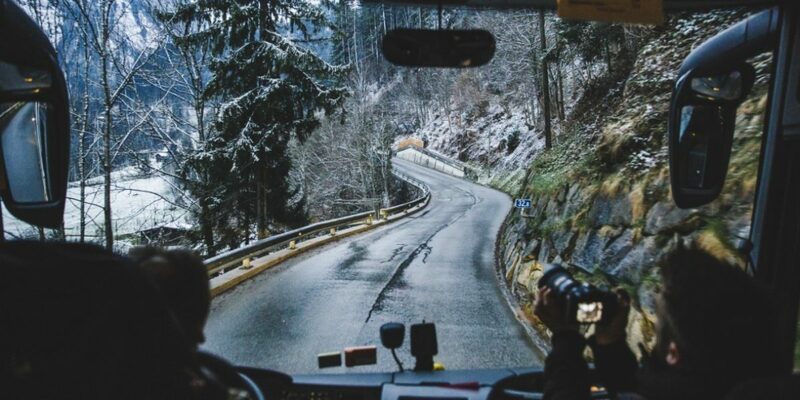 Is there a minimum age required to attend Snowbombing Canada? Yes, you must be at least 19 years of age to book and attend Snowbombing Canada. Festival security staff will ask for proof of age ID and anyone less than 19 years of age will be declined entry to any of Snowbombing’s licensed venues. When is the last payment due? The last payment is due on Friday, February 15th at 11:59pm. We suggest paying as soon as possible to avoid any problems that might arise. You can request changes by emailing customerservice@snowbombingcanada.com. Please provide your booking reference and details of the change. Please note changes cannot be made at the resort during the festival. All cancellation requests need to be put in writing and sent to customerservice@snowbombingcanada.com. You will be contacted and advised of the cancellation charges that will apply; for more details see our terms & conditions. On completion of cancellation, you will be sent an email confirmation. One of the best things about our booking system is that you can buy the accommodation and wristband and then log in to your customer account again later to add any other extras you might want. The extras include: Equipment Rentals and Lift Passes. Extras are bookable until 4 weeks prior to the event. We strongly advise against booking extras on your arrival or departure dates as refunds will not be provided for any activities missed due to delayed travel. Each accommodation location has available Car Parking for your convienience but vary in cost depending on location. Please contact your accommodation location after booking for more info. We do not sell flights, but they are available for purchase through West Jet and other airline companies. When will I find out which hotel room I am staying in? 7 days before the festival, all customers will receive their E-Tickets, which will include the full address and contact details and essential information on your accommodation booking. All documentation will be emailed and you will need to have a printed copy available to check in. The condos are located in Sun Peaks Resort. As a whole, Sun Peaks is relatively compact so you are never to far from the action! Want a free trip to Snowbombing Canada? Gather your gang and book through our Ambassador’s Program with special perks available! By becoming an Ambassador, you will get a personalised group page where your friends can make their bookings and you can reap the rewards! More info on this coming soon. The easiest way to pay is by logging into your customer account where you have access to manage and pay your own part of the booking. Please note that payments over the phone must have the cardholder present to authorize payment. At the time of booking, $150 (+ s/c) deposit fee per person will be charged. The full balance is due on Friday, February 15th at 11:59pm. For bookings after February 15th, the full payment will be due at the time of booking. How much spending money should I bring to spend? This is dependant on many factors, but we would say a nice mid-ground benchmark would be budgeting $100 a day. Average drinks prices are $8, similar to any Canadian ski resort, with a choice of supermarket, cafes, sushi restaurants, pasta joints and steak houses of differing price ranges. What is it like at Sun Peaks? The village is traditional with a lovely alpine feel You won’t see any concrete blocks here, and it all sits tightly between three snowy mountains. 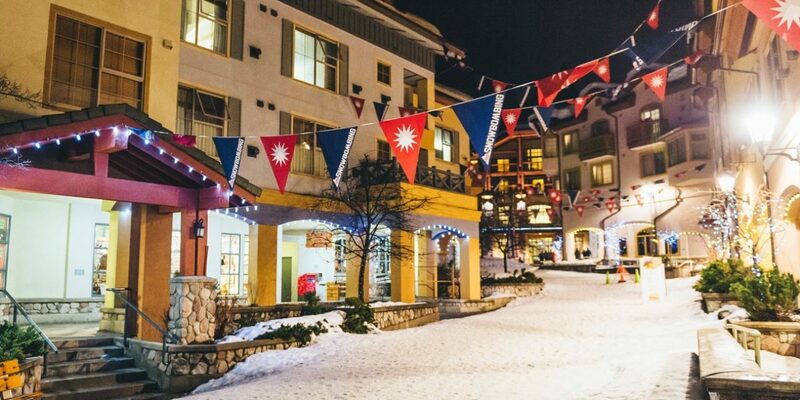 Everything is a stone’s throw away – the ski lifts, bars, nightclubs and restaurants. The local residents are lovely and incredibly enthusiastic about Snowbombing too! The accommodation are great, whatever your budget – whether you book an alpine Condo or a four star Suite. Condos are very spacious, with catering equipment and kitchen area, plus a lounge area and bedrooms. If you’re looking for extra luxury, some also include your own private hot tub! Have a look at the accommodations on our booking page. Sun Peaks sits at 2893ft, with the ski lifts taking you up to 7060ft, where you will find more snow than you can imagine. A great bonus of going to Sun Peaks for Snowbombing is that the spring rays allow you to board or ski in a t-shirt, hang out on the terraces for food, and drink in the sunshine! Of course, no resort in the world can ever guarantee perfect snow, but Sun Peaks does a pretty good job with over 6 meters of snowfall every year! Sun Peaks has slopes to cater for skiers and boarders of all abilities. For more information on the mountain, please visit Sun Peaks Resort. Don’t worry, plenty of Snowbombers have never been to the mountains before! If you want to ski/board, lessons of all skill set will be available for purchase through Sun Peaks Resort. Where are good places to eat & drink? There is truly something for everyone’s taste! From locally roasted coffees to fresh made smoothies, fine dining to juicy burgers, award winning cinnamon buns to tasty paninis, you will never be short of options for refuelling! What makes Snowbombing the world’s greatest show on snow?! 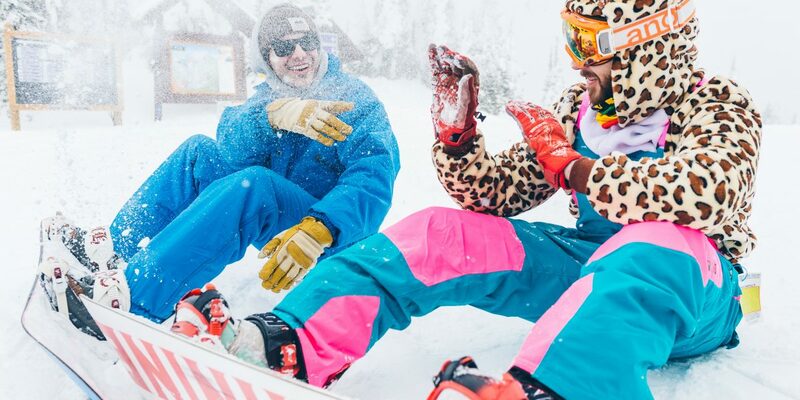 Snowbombing is like no other event you’ve been to! The music and surroundings create the perfect experience for each and every Snowbomber. When can I see the lineup schedule? The full festival schedule will be announced closer to the festival date. We have entertainment all over the mountain! From the Sundance Terrace sitting in the middle of a run, to the car park at The Underground, to the outdoor spectacular at The Street Party. Everything is just a stone’s throw away! • Waterproofs – Ski pants and jacket are the best. • Layers – These will keep you warmer than one big jacket. • Sunscreen – The climate is very deceiving, making it easy to get burnt even if you think there isn’t much sun and the altitude makes you more susceptible to the UV. Make sure you bring plenty of decent sunscreen and lip balm for those dry days. • Sunglasses/Goggles – Nothing hurts more like the sun in your eyes! Make sure they are UV protectant and waterproof if you plan on hitting the slopes. • Footwear – Bring a decent pair of waterproof boots or snow boots and the terrain can be slippery. • Board/Ski – Don’t forget your snow equipment! But if you do, don’t worry: snoq equipment is available for rent at the resort. • Costumes – Don’t forget to flaunt your style! Theme Days will be in full effect. • Towels/Swimwear – Hot tubs and pools are available if you want to relax your muscles. • Totems/Flags – Rep your Snowbomber crew and bring things to easily spot one another. It ain’t a Westcoast festival without something that glows!